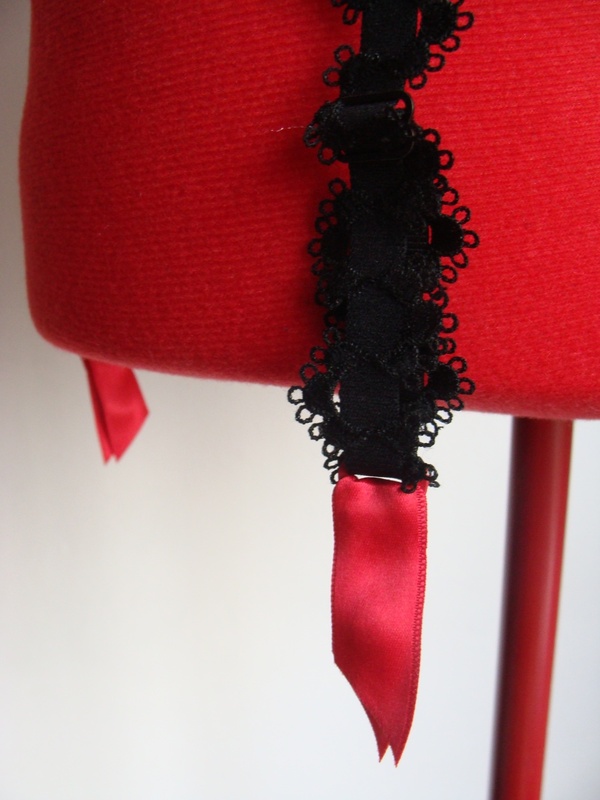 Close up of the garter clips. I like the touch of red. It took me another 4 hours on Saturday to finish this one, and it’s far from perfect, but I’m so glad it’s done! I made this “torselet” (I can’t find a good English word for it… any suggestions?) as part of my lingerie sewing course. It’s made exactly to my measurements and fits quite nicely, but I’m not sure if I’ll really wear it a lot. The sewing gave me quite a bit of grief at points. For example, there’s only boning in some of the boning channels, because even though I thought I stitched perfectly accurately along the sides, the boning would JUST NOT FIT. Anyway, I’m happy that I have finally sewn something again. And now I have an ironing board in my new house, working on all those other things will be a lot easier! The underwires sit beautifully. I will probably finish the thing off with a nice red bow to echo the garter clips. The back isn’t super interesting, but oh well. The solid black part is the only part of the whole bodice that stretches. It’s kind of a pain to get it closed up, but it looks quite good.